Aggies stomp the Eagles out in Durham. 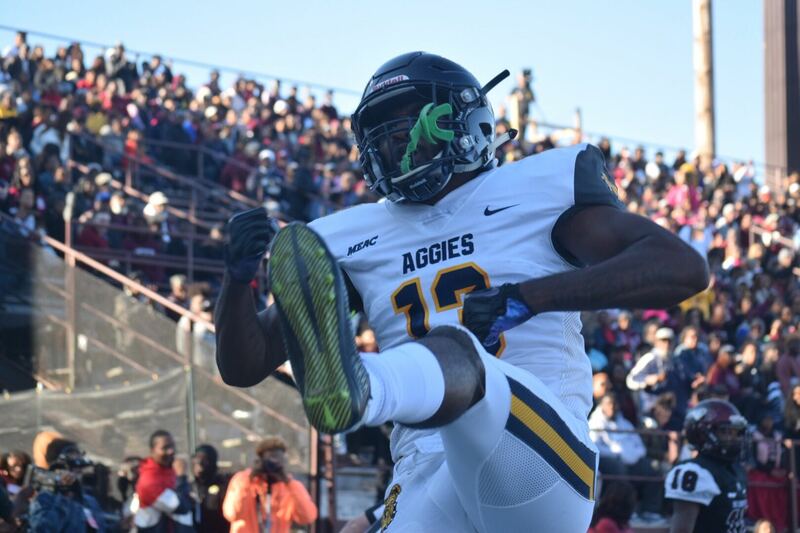 DURHAM, NC–Coming into the day it didn’t matter what North Carolina A&T did against North Carolina Central, they still needed help from Bethune-Cookman to make it back to the Celebration Bowl. NCAT (9-2, 6-1) didn’t get the memo because they came out against North Carolina Central (4-6, 2-4) as if their collective lives were on the line winning 45-0. With this being one of the saltiest rivalries in the MEAC, of course, there was plenty of jawing before the game even started. The coin toss was less than cordial but the Aggies did the rest of their talking on the field after the kickoff. The Aggie playmakers set the tone in the first quarter with Lamar Raynard finding Elijah Bell for a four-yard touchdown. Later in the quarter, it was Marquell Cartwright on a 35-yard touchdown run to put NCAT up 14-0. In the second quarter, a field goal and a Jah-Maine Martin ten-yard touchdown run put the Aggies up 24-0 at the half. The third quarter was an inverse copy of the first, Raynard to Bell and another Cartwright touchdown removed all doubt of a comeback as NCAT went into the fourth quarter leading 38-0. Kashon Baker put a touchdown on the board for good measure in the fourth as NCAT embarrassed the Eagles on their home field. After the game ended the Aggies checked in on the closing stages of the Florida Classic and soon discovered they would return to the Celebration Bowl. The Wildcats picked off FAMU and returned it for a touchdown with 17 seconds remaining to kill the Rattlers shot at a trip to Atlanta. North Carolina A&T will face the yet to be determined champion from the SWAC in the Celebration Bowl. As of Saturday, it could be either Alcorn State, Southern University or Grambling State.